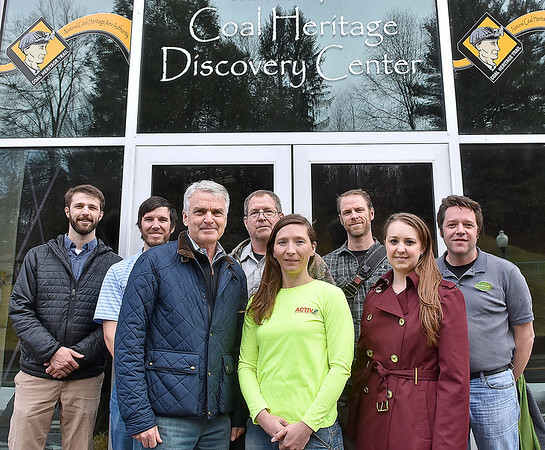 Members of the Active Southern West Virginia team and supporting community members pose for a quick photo outside of the Coal Heritage Discovery Center during a break in a tour around downtown Mount Hope Wednesday afternoon. In the front row from left to right are William Massey, chairman of ASWV, Melanie Seiler, Executive Director or ASWV and Claire Rozdilski Outdoor Recreation Planner for the National Park Service. In the back row from left are Andy Davis, working with ASWV through Americorps, Phil Waidner, Wheels Program Manager for the Boy Scouts of America Summit Group, Raleigh County Cycle Club's Gary Moorefield, Marathon Bikes' Adam Stephens and West Virginia State University's Adam Hodges.